In the past, to me, the most amazing sunrises in Chicago were viewed from high-rise apartments that look out over Lake Michigan, while the most spectacular sunsets were seen from the deck of a sailboat while coming into one of Chicago’s harbors after a Wednesday night beer can race. Since beginning to row this spring with the organization Recovery on Water (ROW), I’m gaining a new appreciation for both the Chicago River and being out on this very unique waterway at sunset. Granted we row on Sunday mornings as well, but the evening rows have become my favorites. ROW has a policy of our not taking cameras/phones out on the boats with us when we row, which is very understandable since we need to focus; however, the photographer in me has been extremely unhappy simply taking images mentally, wanting instead to capture my view from the water on film. To rectify that situation–and to watch the experienced rowers crew–I went out on a night for ROW 2 & 3 crews, riding in a launch with one of the coaches so I could try to capture some of the magic I feel being out with ROW. 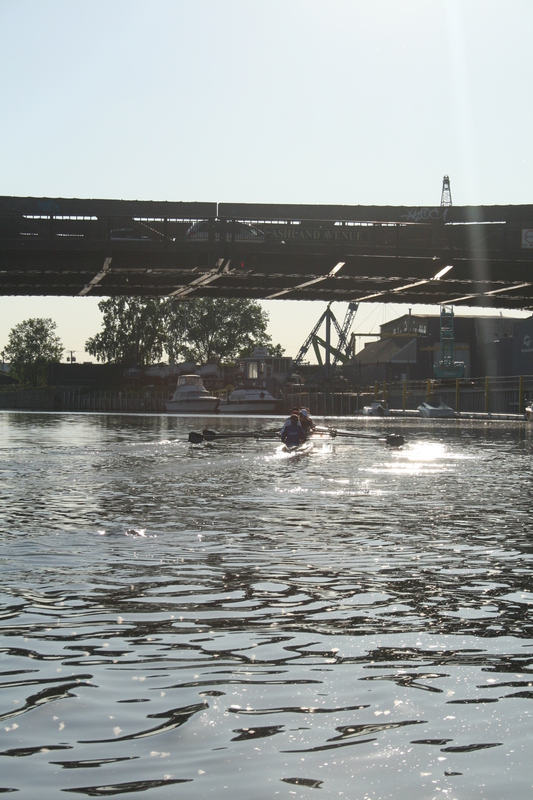 We row out of Bridgeport, a funky, neat area near the stadium formerly known as Cominsky Park (where the Chicago White Sox play). 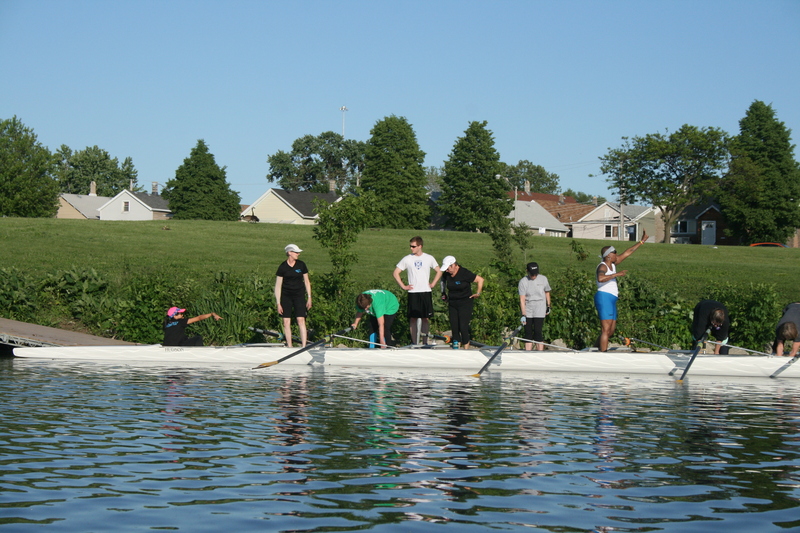 There has been a push in the last 5 or 6 years to build a number of rowing clubhouses along the Chicago River and there is one planned for this area of Bridgeport; however, groundbreaking was supposed to happen this month, but has now been pushed back to September. Yep, that is the building formerly known as the Sears Tower (currently the Willis Tower) in the background. The boathouse is supposed to be on this empty stretch of land. 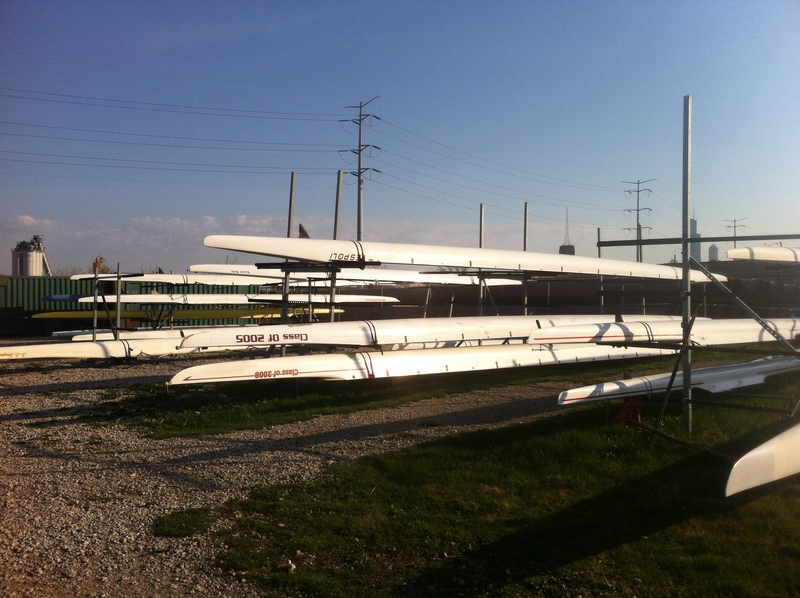 In the meantime, ROW and a number of row clubs & teams (including the University of Chicago crew) store their boats in a fenced in area and gear in shipping containers. 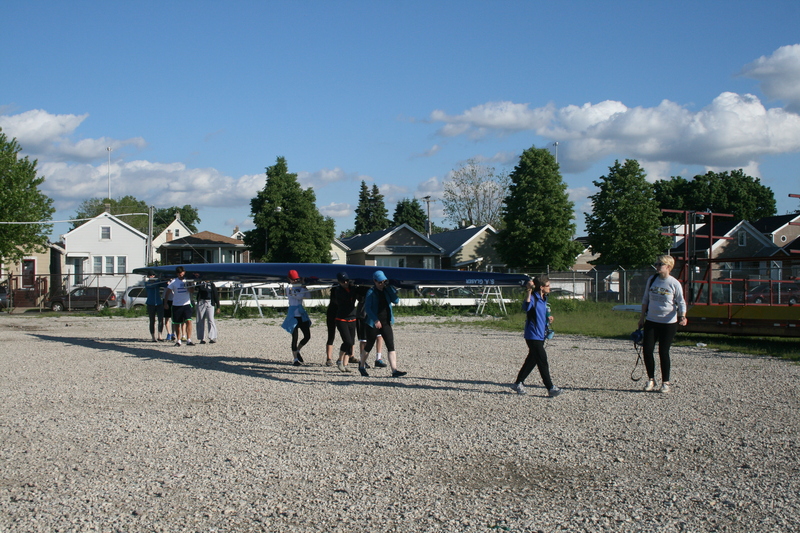 We carry our boats down to the water each time we head out (with the novice ROW 1 group–my group–there is a lot of help from volunteers and coaches thank goodness) and can I just say the experienced rowers make it look almost easy to do. They are rockstars!!!! The Eleanor Street launch site is on the South Branch of the Chicago River at the U.S. Turning Basin and the beginning of the Chicago Sanitary and Ship Canal, which eventually links up with the Mississippi River. For anyone who has spent time in Chicago, this area is south of the Loop and China Town. At the basin, the river is joined by a tributary, the South Fork of the river, which is more commonly known as Bubbly Creek. Bubbly Creek is a very stagnant stretch of water, but it is flat and smooth and perfect for rowing. This is the area we rowed on the first dozen or so times out, but a couple of weeks ago barges were left at the opening of Bubbly (one with New Orleans on its stern) and it has been very difficult to maneuver around so we have been going out on the South Branch instead, heading further south rather than towards downtown. 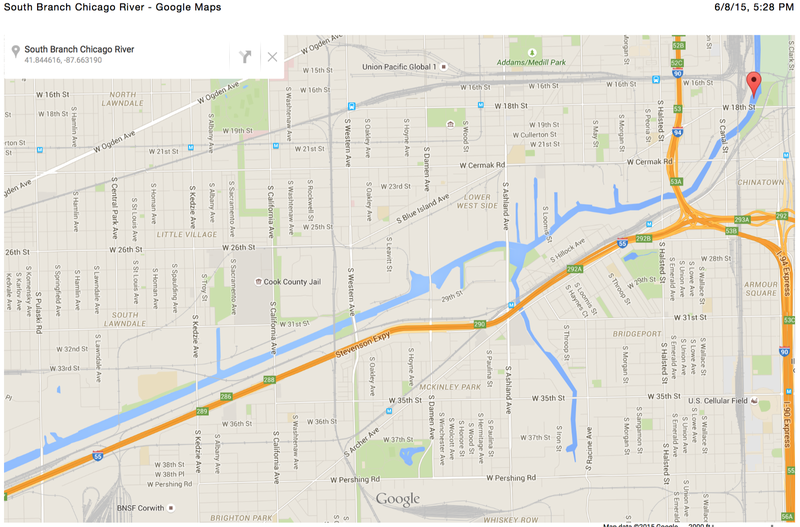 Off under the Ashland Avenue Bridge! Here is a gallery of a few of my favorite shots taken from the water. I’m so impressed with what the experienced rowers (who except for one or two women never rowed before in their lives before joining ROW) can do!! These women are amazing to watch! I’m also fascinated by the peacefulness of the river in the midst of all of these industrial structures, both functioning and abandoned, and tried to capture that interplay. 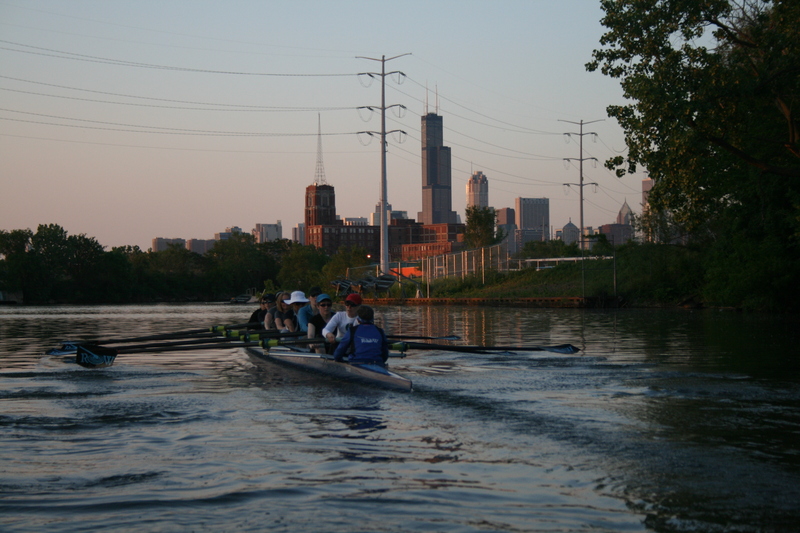 Wrapping up a beautiful night on the water, this picture combines the city, the river and the ladies of ROW…. 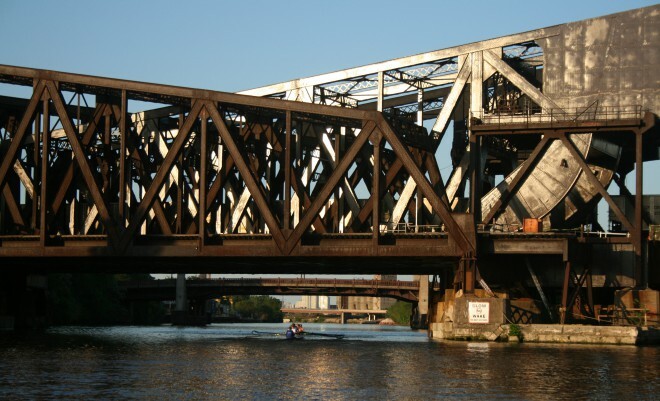 This entry was posted in Action & Activism, Health, Living Life Fully and tagged BC Rowing, Chicago River, ROW Chicago. Bookmark the permalink. This is all so new and interesting seen through your eyes! Love the pics! Great interplay between tranquility of river and urban industry!